What really makes an Evacuation Diagram is the same details that make movie posters and billboards effective. It all comes down to the details like colour, fonts, size, symbols and much, much more. We don’t know about you, but we consider a great plan to be art. Colour is an incredibly powerful tool in communicating ideas, procedures and equipment types. Fast. Clear colours can tell a reader where they are, and where equipment or safety can be found. The advantages of clear colours cannot be stressed enough. It cuts across language, age and culture. Think of red, yellow and green. When was the last time you remember green being for something dangerous? Did you know that fire extinguishers are all colour coded based on what fires they can put out? You don’t want to pour water on an electrical fire, so the labels need to be crystal clear. We all know Times New Roman, Comic Sans and Stencil, but have you ever really thought about how font can change the seriousness, readability or impact of words? 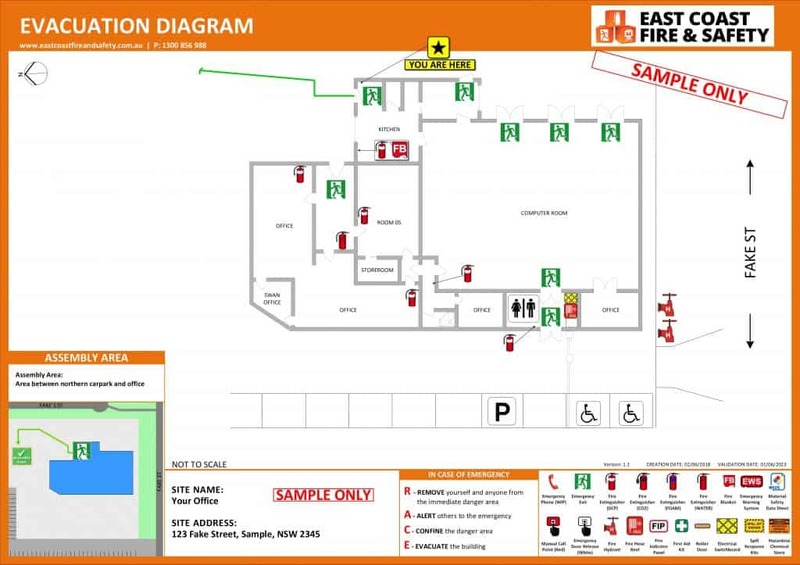 The correct choice of font can increase the clarity of your evacuation diagram, removing some of the doubt in an emergency situation. There is nothing is worse than trying to read something poorly labelled in a rush. Think about last time you cooked in someone else’s kitchen, you rush through cupboards, hastily open drawers, and generally grow increasingly frantic. Now imagine this moment if people’s safety is on the line. Everything from the size of the printed words, to crowding information on the image. If a plan takes time to read, the plan is not effective in communicating its crucial message. Like most security or safety measures, you never plan to use your evacuation plan. Unfortunately, this can mean is that sometimes the placement of emergency equipment or diagrams are a little too tucked away. Out of sight, out of mind really has an impact. When deciding on the layout of the new office, your emergency diagrams, procedures and equipment should be obvious and easy to spot. We understand that a wall-covering safety diagram isn’t likely to be the centrepiece of your interior design. However, temptation to make prints too small can impact readability and effective communication. 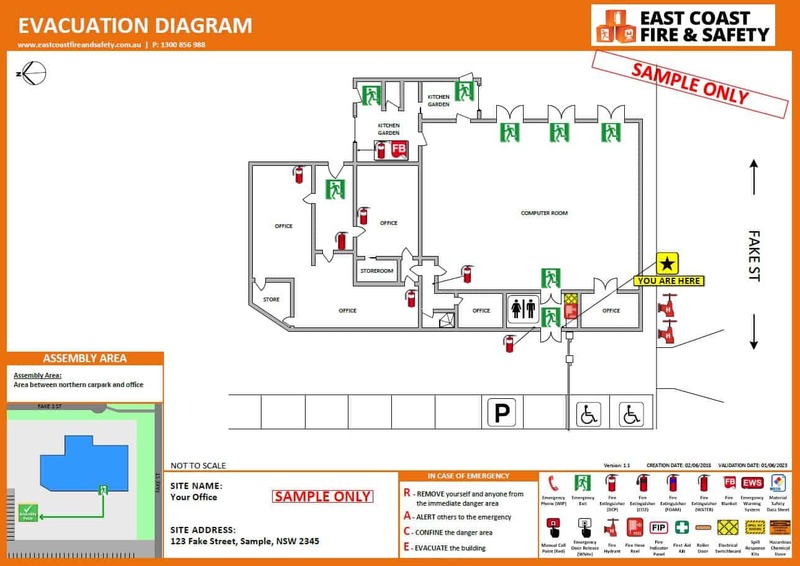 The Government provides guidelines to placement, size, printing material and orientation of emergency diagrams. All East Coast Fire & Safety’s systems fully comply or exceed requirements of AS 3745-2010 to ensure you, your staff and your clients are as safe as can be. If there is one element of your business that you never want to cut corners in, it is safety. Entrust us at East Coast Fire & Safety to prepare an industry leading emergency plan for your business today.